I renamed my resigner to 'TrueAncestor EBOOT Resigner'. - Re-make user interface and script. - Re-make scetool key file (appldr to 4.30/npdrm to 4.25). - Add 3.41 CFW support. 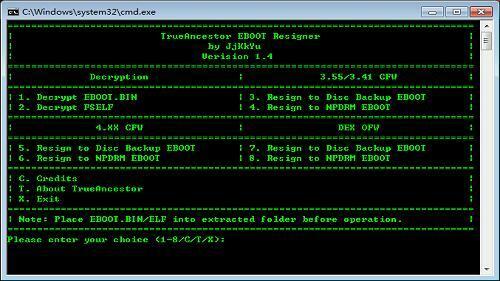 - Add decrypt FSELF option. - Auto-load ContentID from npdrm EBOOT. - Fix 3.55/3.41 resign for some games.